In her most recent volume of poems, Nomina, Karen Volkman pairs formalism with unwilling brides, "the wind's white hair," and the movements of stars, setting the stage for an astute meditation on the idea of chance. Written as a book-length series of sonnets, Nomina invokes astral imagery when describing the intersection of love and fate, using form to echo this delineated "sky we bear on our shoulders." In doing so, Volkman's poems present the traditions of Dante and Dickinson alongside their possibilities for twenty-first century poetry, a combination that "blazes" and "radiates" throughout. Invoking phases of the moon as an emblem for the bride's future after being wed, Volkman uses such imagery to convey the inevitability of both commitments and one's efforts to escape them. Just as this bride's "backwards blooming" reflects a freer life before matrimony, the waning moon and retrograde orbits in the poem echo her deterioration afterward. Like many of the poems in this volume, "Blank bride of the hour" combines traditional rhyme, meter, and structure with a contemporary outlook on gender roles as well as stylistic choices, suggesting new possibilities for poetic technique. note resounding a transparent flute. event left at the altar—the bride is fled. Juxtaposing the "daylight crescent" moon and the cycle of the seasons with images of the errant bride, Volkman leaves readers with an ambiguous stance on "the cold sky" and its role in determining one's path. Although ending with readers drifting "bluely looming" in a liminal space, the piece suggests that the bride's having escaped pursuit by the end of the poem remains impermanent. 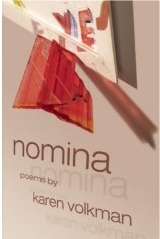 Wonderfully complex in its treatment of literary traditions, "Lifting wither," like other poems in Nomina, proves a graceful meditation on the possibilities of time-honored poetic forms. Kristina Marie Darling is a graduate of Washington University in St. Louis. She is the author of five chapbooks, which include Fevers and Clocks (March Street Press, 2006) and The Traffic in Women (Dancing Girl Press, 2006). A Pushcart Prize nominee in 2006, her poems, reviews, and essays have appeared or are forthcoming in many journals, which include Janus Head, Rattle, The Mid-America Poetry Review, Rain Taxi, The Adirondack Review, The Main Street Rag, Tarpaulin Sky, CutBank, The Mid-American Review, Jacket, Redactions: Poetry and Poetics and others. Recent awards include residencies from the Centrum Foundation and the Mary Anderson Center for the Arts.